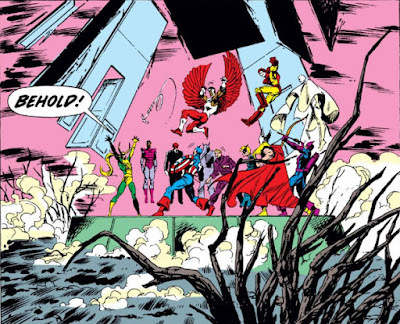 OR: "Pay No Attention To Those Villains Behind The Curtain..."
The last Marvel crossover event to grace the 1980s was the extensive 1989-90 Acts Of Vengeance series of stories, which mainly centered on the Avengers, Captain America, and Thor books but also cast a wide net over a number of other titles. 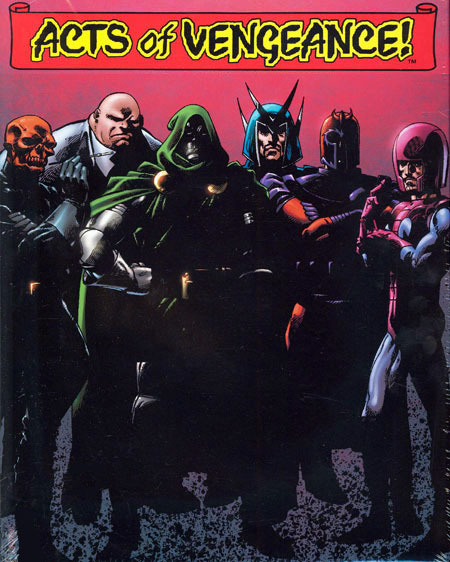 The event's main draw was its cabal of villains who joined together to conduct aggressive operations against super-heroes in order to bring about their end; though it's more accurate to say that these villains were brought together, by a mysterious figure who suggested this initiative and secured the agreement of the villains to participate. Also, Loki's method for getting these six villains to participate and cooperate in this plan is to convince each villain that this is their plan, under their direction and control, with himself serving as their aide-de-camp--a deception which seems doomed to fail from the start, doesn't it? Once you have all of them in a room together, one villain is bound to assert his authority and seek to direct the others, at which point each of the others would make it clear that they are the one who is in control here. Yet in scenes where they meet as a group, the issue is virtually ignored when one of them makes such assertions--which is fortunate for the story, since this group's members would never be able to cooperate with each other otherwise. 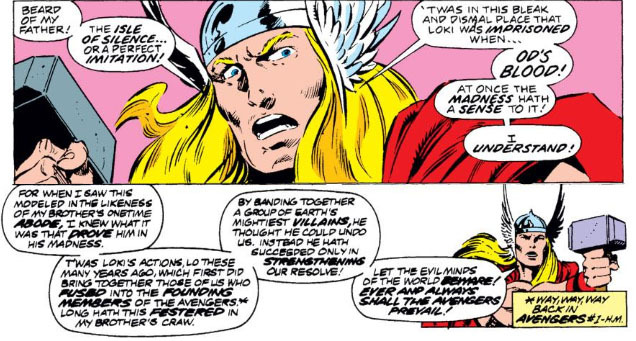 A more workable approach might have been for Loki to simply masquerade as the lackey who follows the will of the collective group--an approach which the reader will probably find him- or herself assuming to be the case regardless, in order to avoid the confusion of this plot oversight. We're also left to fill in the blanks as far as this cabal actually doing something when it meets, carrying out each step of "the plan" (as this endeavor is vaguely referred to) by dispatching their "lackey" to execute the details that they've worked out. Often, however, we get the impression that this underling is taking the initiative on his own, announcing that he's leaving to take care of business and later simply reporting back to the cabal at regular intervals, submitting to their approval and arrogance on his return while continuing to maintain the charade that he fulfills their will. It's likely the most hands-off "Sinister Six" that you've ever come across, at least at first glance. Fortunately, with AOV spread out among many other titles such as Amazing Spider-Man, Uncanny X-Men, Fantastic Four, et al., the slack is taken up by these villains indeed fulfilling the plan in their own ways, in venues where they're more at home and where they prove to be far more interesting in their machinations than in a group setting. Finally, the key component of the AOV that makes our villains believe this plan is a sure thing: that the heroes who are targeted will be attacked by villains whom they've never met in battle, a tactic that will presumably put the targets at a disadvantage. To swallow that, we have to put aside the fact that characters in Marvel titles across the board are often meeting new opponents to battle, characters they've never gone up against before and whose abilities generally take them by surprise. It's the bread and butter of comics already--AOV is simply putting a new twist on it by having it occur over a three-month period in a string of titles that makes it appear to be a coordinated plot. That said, it's not a bad way to spend a few months of comics reading, if you allow yourself to be swept along by that premise. For instance, a string of robots sent by Doom to sink Avengers Island (the former Hydrobase) succeeds and finally gets rid of a base of operations that only served to isolate the Avengers and probably wasn't popular with readers in the first place. 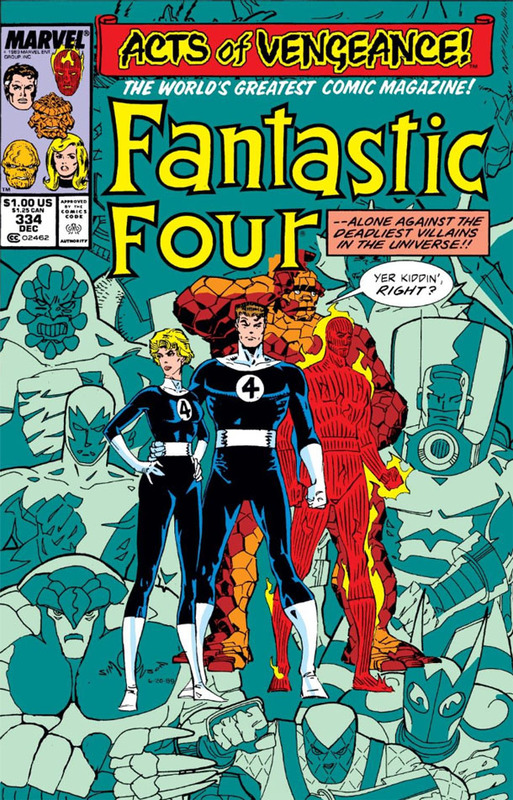 (Though cramming the issue's cover with Avengers who, with the exception of Quasar, never appear in the story probably made the reader flinch at any other title bearing the AOV banner from that point on.) 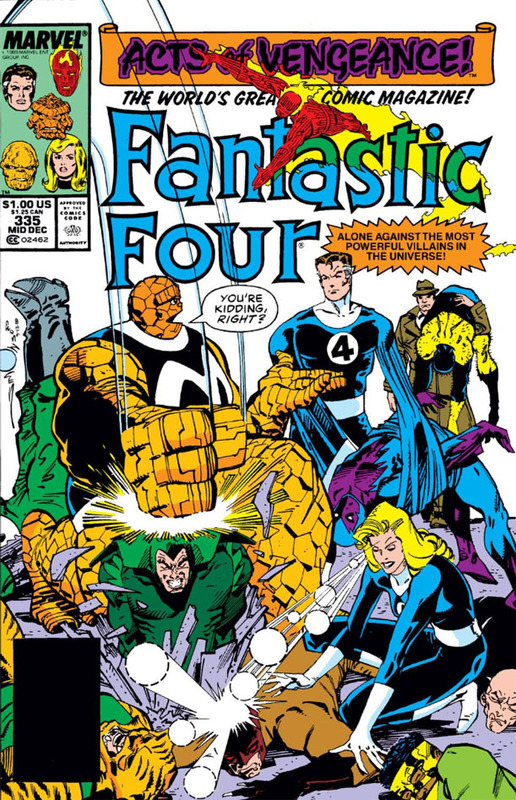 There's also Spider-Man taking on heavyweights like Graviton and Magneto, while attempting to wield the powers of Captain Universe; while the Mandarin nicely works behind the scenes and sets things in motion in the pages of X-Men and elsewhere. And while three members of the former Freedom Force seem to be far more formidable against the Avengers to be believable (with the Scarlet Witch even agreeing: "We should have defeated these cretins easily! "), they still give a good showing of themselves, especially in light of the fact that they're not even part of the AOV initiative. As for Loki, he's not really effective as a protagonist until he steps from behind the shadows to enjoy chewing the scenery along with the villains in this cabal. Until then, he acts to promote the crossover itself, in brief insertions where he gathers the various members of the proposed group. 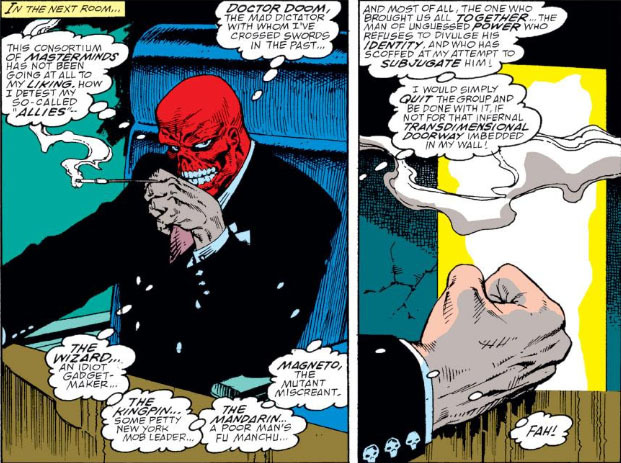 Over in the Captain America book, however, writer Mark Gruenwald makes the most of Loki's impromptu meeting with the Red Skull, giving a more realistic account of how Loki's overtures were likely to be received as well as heightening interest in this mystery intruder. The Skull is the catalyst for the dissension that develops among the group's members, which at times forces Loki to step in and deal with what seem like mortal children to him, with their bickering and pointless posturing for dominance. 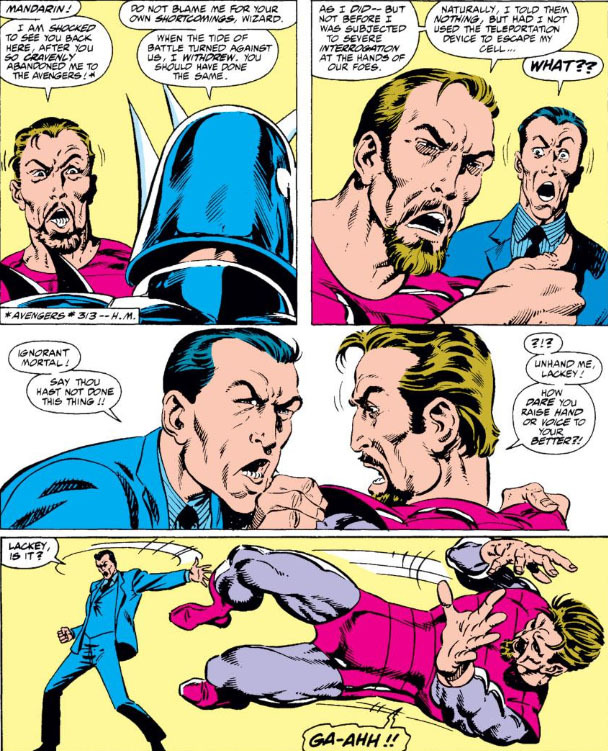 Over in the Cap book, Gruenwald would go on to provide clever scenes that show how the Skull chafes at not being able to subvert "the lackey" to his will--while also handling the eventual confrontation between the Skull and one whose memories of Nazis cannot abide such a man's freedom from retribution. Things have obviously come to a head between these two--but despite his preparations for any incursion, the Skull is mistaken in thinking that he's escaped from Magneto's *ahem* vengeance, particularly in a metal rail car. 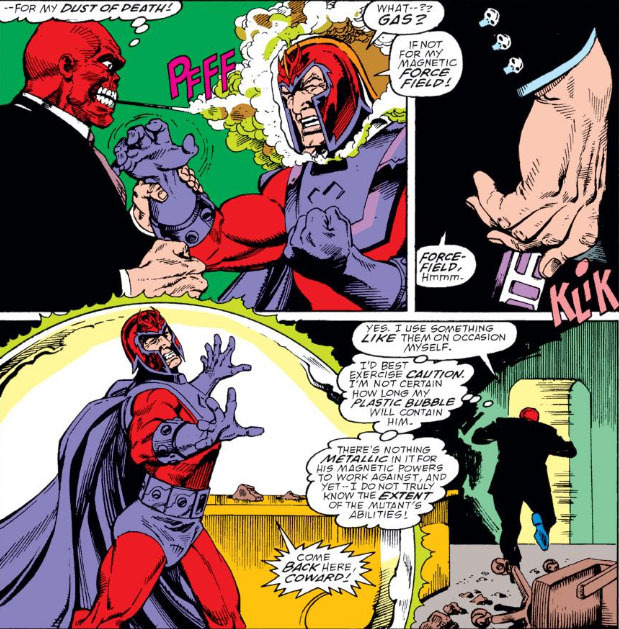 Once the Skull is intercepted, Magneto dispenses his own chilling brand of justice. By this point in the series, it's becoming clear that the heroes being targeted by the AOV are prevailing against the threats being set against them. 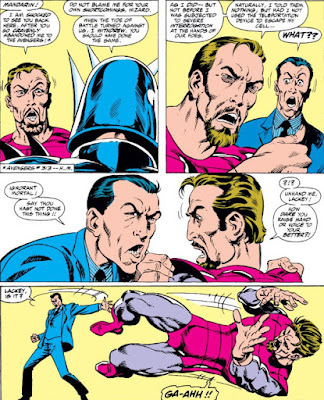 To make matters worse, the Mandarin and the Wizard attack the Avengers on their own, which lead to the Wizard being captured and the Mandarin retreating back to the villains' meeting place. 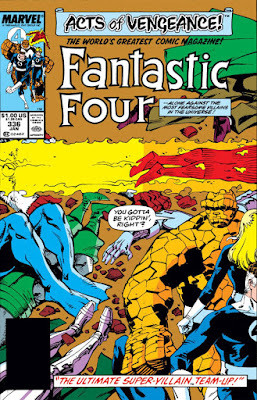 Subsequently, the figure of Dr. Doom explodes, revealing itself to be a robot, with the rest of the group concluding that Doom may have only been present himself at certain times or even not at all. All of which lead to the wrap-up of this event, as the Wizard uses a hidden device that accesses the dimensional doorway to the group's headquarters and allows him to return--to the ire of Loki, who realizes that this mortal may have made a crucial blunder. 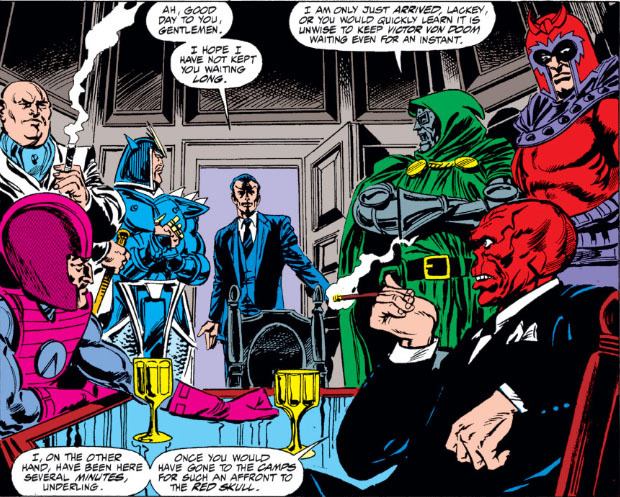 With Loki now tipping his hand and dropping the need for pretense, the Kingpin makes a judicious and discrete exit (with Magneto having already returned to his own concerns involving the Scarlet Witch). Loki then immobilizes the three remaining members of the cabal, and voices the underlying thought that's probably occurred to a number of readers by now--that Loki could indeed have accomplished his ends without going to such lengths, and without having to ride herd on and appease six mortal villains. With Loki fit to be tied, our three remaining villains unfortunately find themselves in dire straits--a lineup which should really only amount to two, in terms of the Red Skull being present. 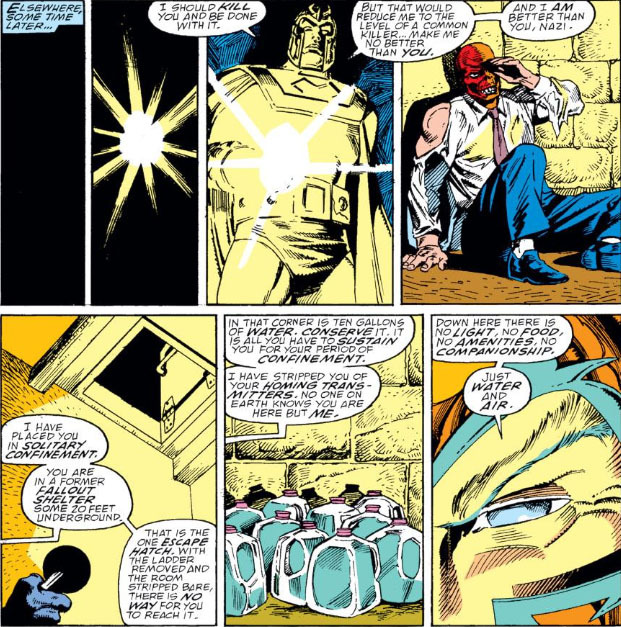 The Skull, discovered in Magneto's confinement hole by Crossbones and hanging onto life by a thread, played out his recovery in the pages of Captain America several issues after AOV had concluded and was in no shape to return to the cabal, much less be an active participant at the time of its dissolution. As for Loki, he's guessed correctly that Thor and the Avengers would follow the Wizard back to the villains' lair--only to find that their surroundings were pure fabrication, the true location allowing Thor to deduce the reason why Loki concocted this scheme against the Avengers. The fact that Loki--a god and an immortal who has contempt for mortals at best and whose sphere of influence is nothing less than the glory and the throne of Asgard--has been grumbling all this time about his part in bringing about the formation of the Avengers is nothing less than astonishing; add to that the fact that he would consider them such a blot on his life that he would spend more than an ounce of his time to align himself with other mortals in order to destroy them, and you have yourself a plot that doesn't even look good on paper. There's always been a sense of symmetry involved with Loki and the Avengers, given the fact that he was their charter villain and their baptism of fire, but, honestly--is it even conceivable that Loki, out for his constitutional with the storm giants or the Norn Queen, would ever give a moment's thought to how a scheme to force Donald Blake's transformation to Thor backfired and resulted in the formation of a mortal group of heroes? With Loki handily dealing with the attacking Avengers (which offers a telling demonstration that he could always do so), it falls to Thor to deal with his half-brother, in an ending that seems far too rushed for a plot which took its sweet time getting here. If you take a look at AOV's reading list, you can't help but give it props for being ambitious in scope. AOV was spread across twenty-five titles, if I've got that right, and over a period of 3-4 months--that's a lot of scheduling to coordinate. And as we saw in the case of the Red Skull, all of the editors and writers involved didn't always avoid getting their signals crossed; for instance, New Mutants, despite having three issues tagged with the AOV banner, reportedly only had one of those issues actually involved with the event, and only two pages' worth, at that. If wide-ranging sales weren't an issue, or if the project had the luxury of being plotted with a few more months' lead time, we might have ended up with a much tighter story with the dots easier to connect; in addition, the story could have been driven by any number of villains who had it in for the Avengers, which might have led to a more anticipated and more exciting climax. Nevertheless, AOV is well worth a look--not only as a series, but for the individual books that dig a little deeper into their respective talent pools to produce tie-ins with it, and in doing so turn out to be very good reads on their own. Assuming you have the stamina and want to dive into this event in its entirety, there's the Acts of Vengeance Omnibus containing the so-called core reading, along with the Acts of Vengeance Crossovers Omnibus hardcover which covers most of the tie-ins (maybe even all of them--it looks pretty comprehensive). And if you do take the plunge and snag the books for your comics shelf, think how cool it'll be to be able to scream: "VENGEANCE IS MINE!!" With an introduction like this, you simply don't waste time with preamble! Billed as "the 5-in-1 threat," the Quintronic Man has been rolled out to deal with none other than the incredible Hulk, currently rampaging through the streets of New York and meeting not-so-heavy resistance from local police forces whose weaponry might as well consist of sling shots when faced with such an adversary. Designed for interstellar exploration by Stark International, apparently its five-man team suddenly got the word that they were being mobilized to take the unit into combat with the Hulk. And while you and I might have responded with, "Whoa! That's not anywhere in the vicinity of our job description, bub! ", these men look like they were just waiting to get the call, don't they? No, suffice to say that I don't know how the Quintronic Man adds up to being a Hulkbuster. These men aren't combat specialists--they're technicians training on this thing to explore alien worlds. How would you like to be in one of those pods back at the lab, checking your (I don't know) soil sampler, and then suddenly find yourself getting orders to take on the Hulk? In a unit that's still in the testing stage? I wouldn't exactly be feeling gung-ho about approaching a bruiser who's been known to toss around tanks and planes like marbles. But let's see how these guys do, with presumably no fighting experience whatsoever under their belts, adapting this construct for combat mode when it was designed for things like atmosphere analysis and mining. (Unless Stark designed it for attacking any aliens it might encounter outright--you never know with that guy.) Given that we've got a 30-page story to fill, I have a feeling the Quintronic Man might surprise us! 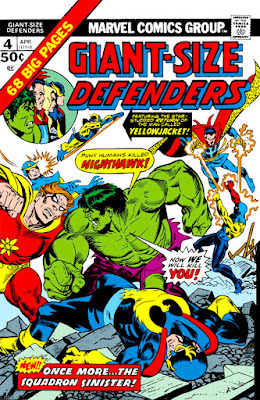 With a guest-star like Yellowjacket, we know there has to be more to this fourth issue of Giant-Size Defenders than just another battle between the team and the remaining members of the notorious Squadron Sinister; indeed, the fact that there is more going on in this story than meets the eye is partially the reason why the Defenders are shown engaging in battle with Hyperion, Dr. Spectrum, and the Whizzer. It's one of the reasons why this tale by writer Steve Gerber and artist Don Heck is such a splendid story, as well as something of a page-turner--for as we flip through those pages, you begin to feel the need to question some of the subtle clues thrown our way as this story unfolds. Why are the Defenders fighting the Squadron in the first place? Did they really kill Nighthawk, their former member who left their ranks and his criminal past behind in order to join with the Defenders? We know from the story's beginning that an attempt was made on Kyle Richmond's life--or was it? We know that two and two probably add up to four, in terms of the trail of those behind the murder attempt leading back to the Squadron--or do we? The story's pacing is nicely handled by Gerber--and Yellowjacket will prove to be the key which reveals the truth, while the members of the Squadron find themselves caught in the middle. Before Marvel's "Giant-Size" line of comics began relying on reprinted material to meet their deadlines, several of the titles in that format produced some noteworthy stories--particularly those featuring the dynamic Defenders, who in 1975 were operating with a core "membership" of Dr. Strange, the Hulk, the Valykrie, and Nighthawk. The Defenders wouldn't have their one and only annual published until over a year later, so a large format book with 40+ pages coming out two or three times a year made for interesting diversions from their monthly title. 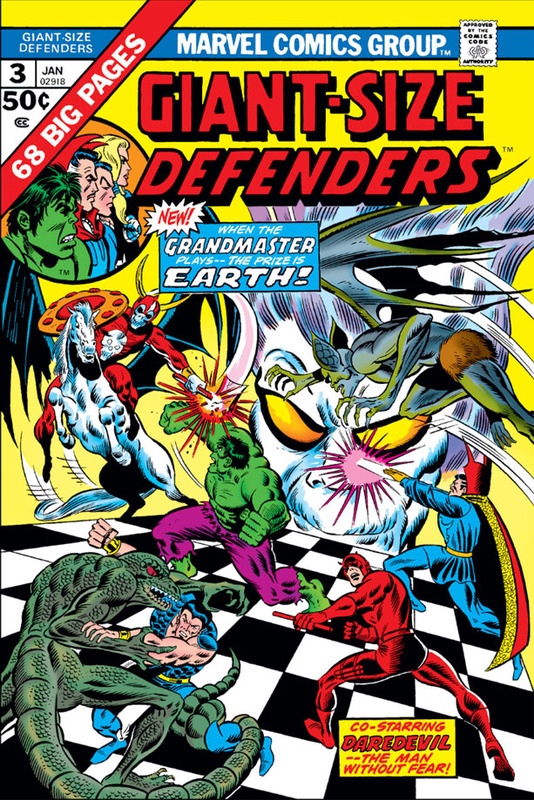 Despite their unofficial status as a super-team, the Defenders have played in the same arena as the big boys often enough to stand out on the comics racks, taking on mainstream threats like the Squadron Sinister, Magneto, the Wrecking Crew, the Sons of the Serpent, et al. 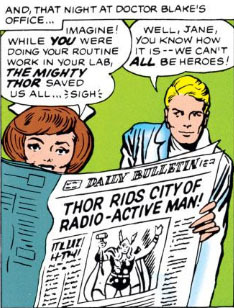 (to say nothing of the Avengers) and keeping them in the comics limelight, if under the radar in terms of their publicity. So in their third giant-size book, it's something of a masterstroke to see the Defenders deal with the likes of none other than the Grandmaster, whose deadly sense of gamesmanship now reaches out to conscript these individuals and place them on a new level of conflict involving the highest stakes while arguably raising their profile with comics readers. 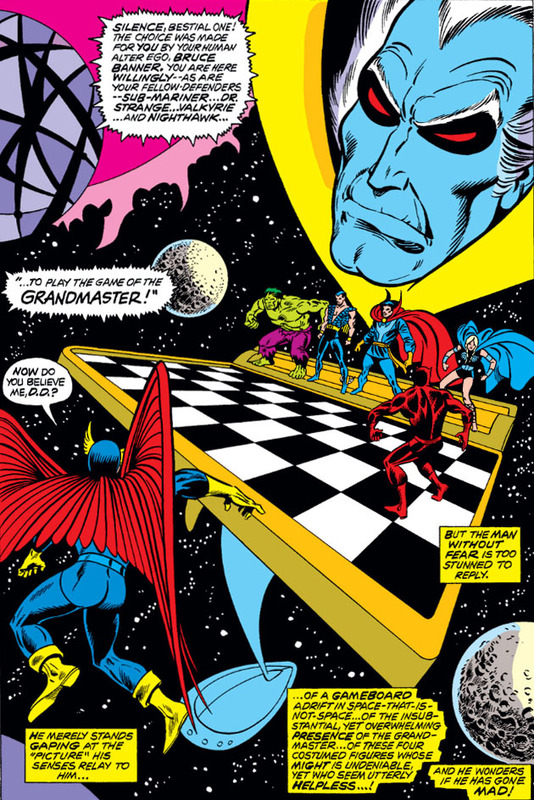 Previously, the Grandmaster played his high-stakes match with Kang the Conqueror, with the Avengers as Kang's champions; but now, in only his second appearance, the Grandmaster returns, once again compelled to compete with another using living chess pieces in combat to determine the winner of the game. The Grandmaster's opponent this time is the Prime Mover, an artificial construct created by Dr. Doom in order to manipulate agents of S.H.I.E.L.D., making his (its?) 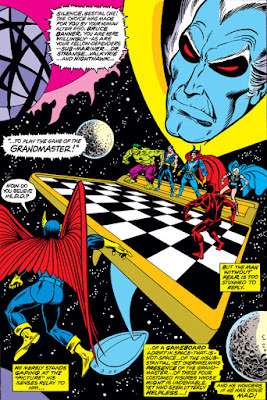 second appearance, as well--another nice touch that this issue includes, and a workable opponent for the Grandmaster. In choosing the Mover, the stakes of the match perhaps lack the drama that Kang's presence and behind-the-scenes activities brought to the table. The Mover, if he wins, is given power to enslave the Earth--while the Grandmaster, should he triumph, simply goes on his way, with no interest in the fate of Earth one way or the other. 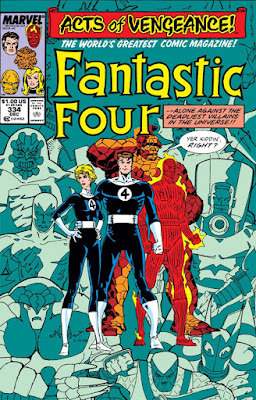 Both players only have eyes for the game, lacking Kang's passion and simmering rage; it's left to the Defenders, then, to provide the story with action, just as the Avengers did previously. 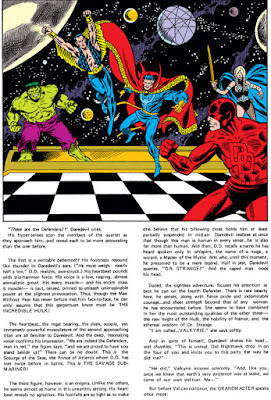 Once Nighthawk seeks out and secures the aid of Daredevil to make the heroes' roster an even six, play commences--but not before Daredevil and ourselves are introduced to the Defenders, in a stylish segment by writer Steve Gerber and artist Jim Starlin that seems designed to sell a new reader on this group and make a distinctive impression. Rocketing Your Way From The North Pole! As we've seen before, the Illuminati have the best of intentions, but are generally lousy when it comes to their execution; yet you'd think that they could at least get Christmas right, wouldn't you? 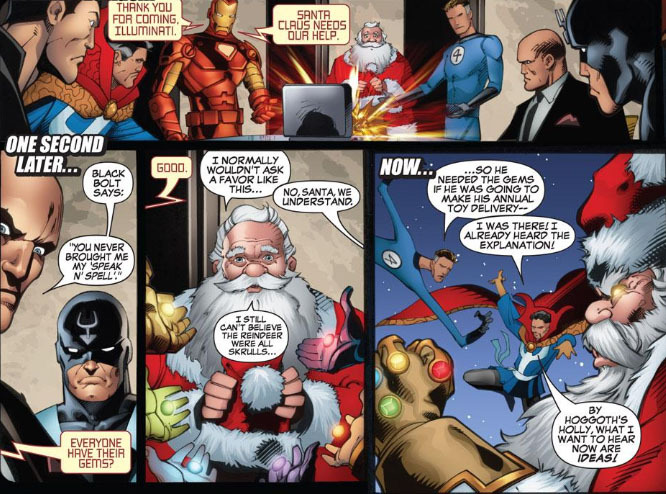 Still, when Santa Claus comes asking for a favor, it's very difficult to turn the old boy down in his hour of need--and when his reindeer are unavailable to provide his crucial transportation on Christmas Eve, the Illuminati come up with the power he'll need to fulfill his annual commitment. All the resources of Charles Xavier, Mister Fantastic, the Sub-Mariner, Dr. 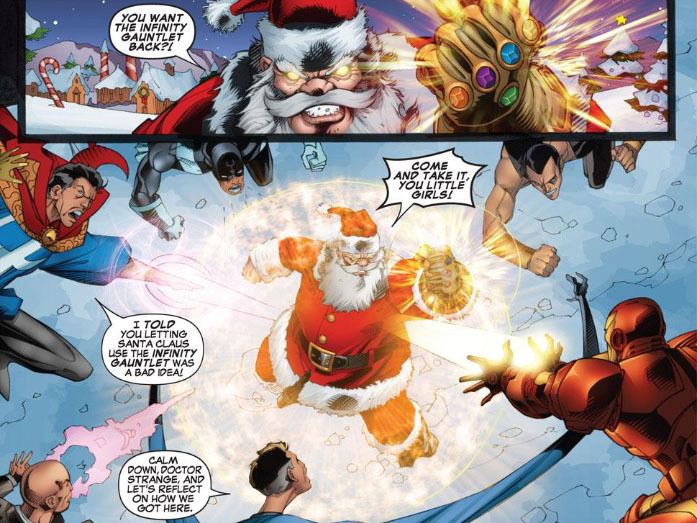 Strange, Black Bolt, and Iron Man might be needed in order to defeat the awesome powers of the Infinity Gems when wielded by "Dark Santa" here. Thank goodness these men never end up using all their resources, because we'd really be in trouble then. 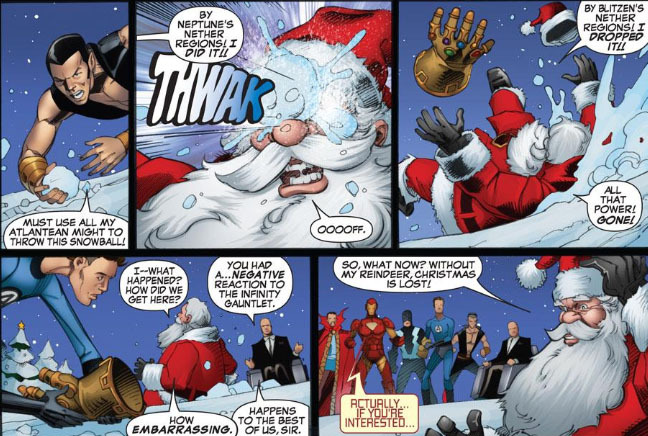 Instead, Santa is brought down by that most powerful of wintertime weapons--a hurled snowball. 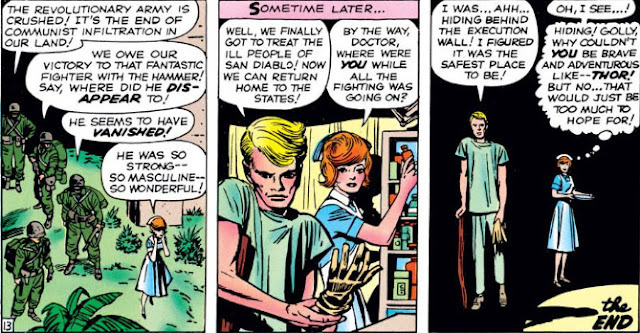 If Iron Man chimes in with a way to handle a problem, it's usually time for the rest of us to head for the hills, as a rule. But this time he might be onto something! 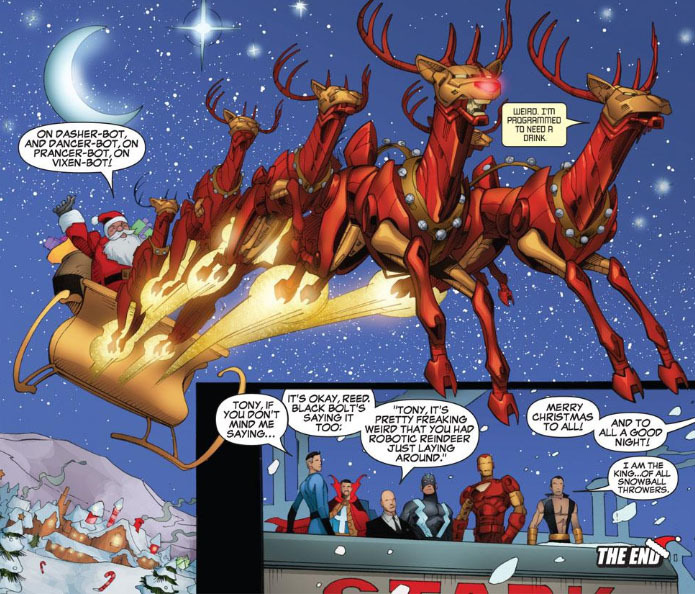 Come on--it was only a matter of time before Tony Stark took over Christmas, right? 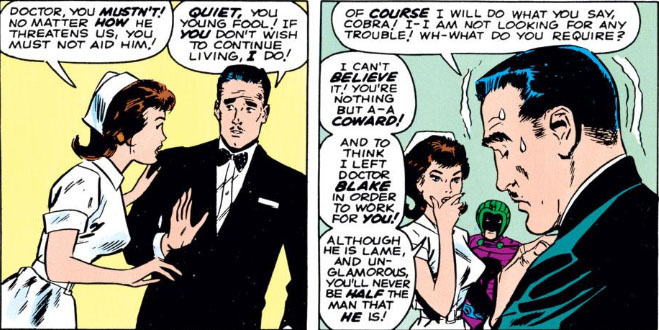 In the very early days of Thor's appearances in Journey Into Mystery, writer Stan Lee took the tried-and-true humorous approach in his treatment of the slowly budding romance of Jane Foster and Dr. Donald Blake--at first having Jane practically trip over herself at how "dreamy" Thor was, with Blake cracking a smile at the thought of her never realizing how close she was in proximity to the one she idolized. 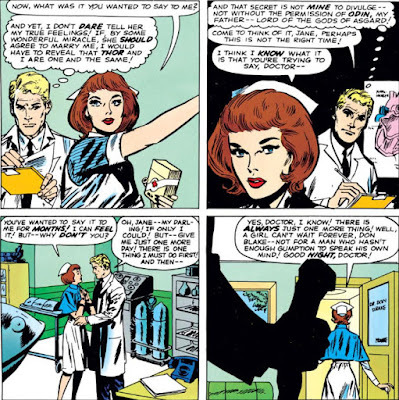 Blake, for his part, found that he was having fast-developing feelings for his nurse--to the point of pining for her, feeling helpless to take matters further due to both his physical affliction as well as an edict by Odin never to reveal his true identity to any mortal. But eventually, Jane began developing feelings of her own toward her employer--not nearly on the same level as Blake's, but getting there. But in the case of Blake and Jane, Blake was coming closer and closer to stepping over that line--and as a result, Jane's relatively harmless comments that compared Blake and Thor evolved into outbursts that seemed to make it clear that Blake wasn't measuring up in Jane's eyes. ...it's also apparent that she still holds Thor as the standard in terms of the strength of character she wants to see in Blake. And while it's no crime to wish to see other qualities in the one you love, Jane arguably sets the bar far too high in Blake's case. In the meantime, Blake is faced with another complication--the fact that Odin has now made it clear in no uncertain terms that his petition to wed Jane is denied. To her credit, it doesn't take long for Jane to see the light, when the Cobra attacks Andrews' office looking for medical supplies and Jane finds that the courage of "that wolf" only extends to his pursuit of women. From this point, it seems that Blake's only roadblock to Jane lies in his decision on whether to defy Odin and reveal to her his identity as Thor. Well, we already know the answer to that, don't we--but exactly how did it come about? 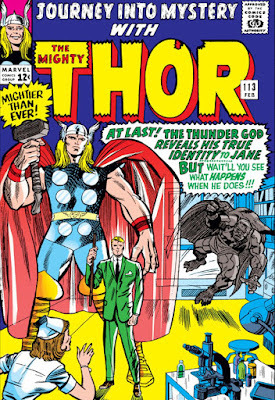 When did Donald Blake finally reveal his identity as Thor to Jane Foster? Spider-Man and Doc Ock--Partners In Crime! 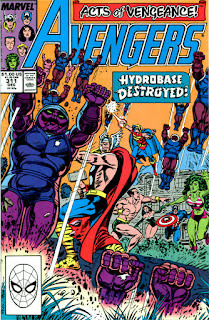 The Hulkbusting Power of the HS-1000! Death to Earth! Death to the Thunder God! Death Is The Name Of The Game! ...And A God Shall Fall! The Maddening Mystery of Madam Medusa!